Since 15 years old he studied at Académie Ranson, where he had as teachers Maurice Denis and Paul Sérousier. He worked on the illustration for “Les souvenirs d’egotisme”, from Stendhal (1924) and “Les exploits d’un jeune Don Juan”, from Apollinaire (1926). When he was 23 he was hired by Daniel Henri Kahnweiler and in 1929 he had his first exhibition with a great success. Roux’s work often is divided in two parts: the surrealistic period and the figurative one. His first period is very interesting. Nevertheless his paintings have been quite hiding for more than 50 years and no-information left his work confined. 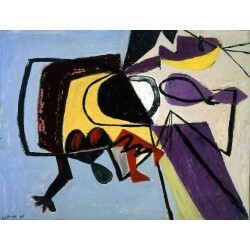 In 1950 he decided to return to the figurative painting, fact that ends his relationship with Kahnweiler. 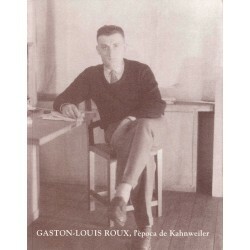 Roux had several individual shows as all Kahnweiler’s artists: Pablo Picasso, André Masson, George Braque, Juan Gris, Fernand Léger, André Derain, etc. His work had appeared in many Roger Vitrac’s articles and in several Cahiers d’Art publications. Galeria Joan Gaspar discovered this artist in 2001 in Paris and since that moment the gallery started to play the role of the principal centre of dissemination for Roux’s art in Spain. The exhibitions in 2001 and 2005 were significant approach the society to the work of this artist. Today many of his works are present in Spanish and international collections. 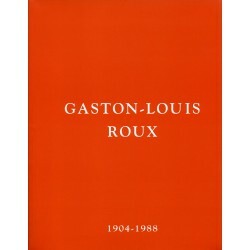 ROUX Gaston-Louis There are 3 products. Catalogue Artist: Gaston-Louis Roux Title: "L'època de Kahnweiler" (catalogue from the exhibition that took place at the Galeria Joan Gaspar, Barcelona) Year: December 2001 - February2002 Size: 27 x 21,2 x 0,4 cm. Pages: 95 Illustrations: 46 Attention! The colour that you see at you screen may vary from the original catalogue. Artwork Artist: Gaston-Louis Roux Title: "Petite mère fouettard II." Year: 1947 Media: Oil on canvas Size: 50 x 65 cm. Attention! The colour that you see at you screen may vary from the original catalogue.